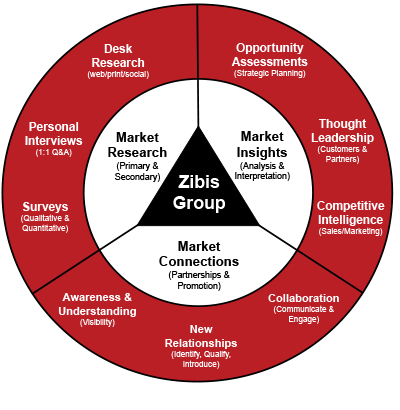 Services | Zibis Group Inc.
Our focus is on assisting customers in staying ahead of the curve and in providing them with the tools they need to more effectively address market challenges and stay on track with overall corporate goals & objectives. Through our proprietary methodologies we have the practices in place to effectively research, analyze and interpret data and turn it into actionable insight so clients can make informed business decisions. The Zibis Group team has been providing intelligence and insight on the ICT sector for over 15 years. As a result of this longstanding focus we have an extensive network of contacts and strategic relationships that allow us to reach all corners of the globe, well beyond our North American roots. Our research and advisory services can be tailored to any customer requirement, leading to unbiased assessments and defendable conclusions. Market Research and Advisory Services that put pertinent and timely information into the hands of today's and tomorrow's tech leaders. Copyright © 2019 All Rights Reserved by Zibis Group Inc.